As shown in the image below, what I need is to drag down the cell and get the values as shown in the yellow cells. The values will go into successive rows, but will be taken from every 4th column, from the same row as the value I drag down. In this example, the cell I'm dragging references B1, so the cell below it should reference F1, the next cell J1, etc. I've tried Googling a solution, and tried using OFFSET and INDIRECT functions without success. Not the answer you're looking for? Browse other questions tagged microsoft-excel microsoft-excel-2010 worksheet-function or ask your own question. 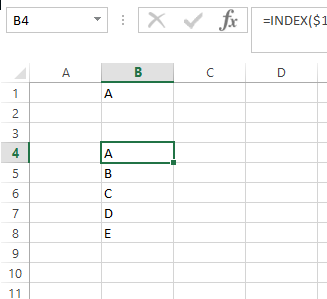 Want to use HLOOKUP to drag down the whole column, how can I do this? Conditional formatting Excel 2007/2010: Highlight the first cell in the row that contains duplicate values? Excel how to insert below cell value and skip every other row?